TRIVIA of Noh : Q115 : Which opera is based on Sumidagawa? | Home | Trivia | Q115 : Which opera is based on Sumidagawa? Which opera is based on “Sumidagawa”? English composer Benjamin Britten was very impressed by the Noh play "Sumidagawa" when he saw it during his visit to Japan in 1956. After returning home, he used it as the basis for the opera "Curlew River," which premiered in 1964. A curlew is a bird of the Scolopacidae (sandpiper) family. In Europe, the word usually refers to the Eurasian curlew. Britten named the opera Curlew River for the miyako-dori (black-headed gull) that appears in Sumidagawa. The opera is structured as a play within a play. 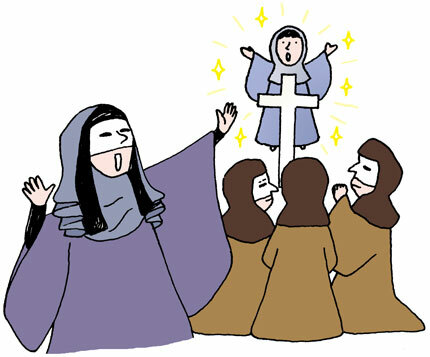 The setting is a cloister in medieval Europe, in which monks perform a story about a mad woman who lost her child. The storyline is almost the same as that of the Noh play. In the opera, the ferryman and the traveller are sung by baritones, the mad woman by a tenor, and the spirit of the boy by a treble. The chorus of pilgrims acts like the chorus of a Greek tragedy, singing melodies different from the main characters to develop the plot. The major difference between the opera and the Noh play is the final scene. The Noh play leaves a gloomy feeling by showing the mournful mother searching for her child's ghost. In the opera, reflecting the Christianity of its background, the spirit promises the mother to see her again in the heaven, and the mother is saved in the end.